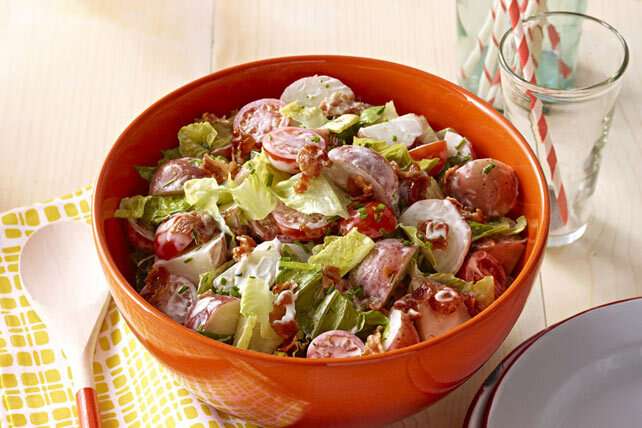 Potato salad is a summertime staple - our potato side dish has all the fixings of a BLT tossed with creamy MIRACLE WHIP. Place potatoes in 2.5-L microwaveable casserole dish. Add water; cover with lid. Microwave on HIGH 8 to 10 min. or just until potatoes are tender; stir. Let stand, covered, 5 min. Drain potatoes; rinse with cold water. Drain again. Mix Miracle Whip and chives in large bowl until blended.